Nuit et brouillard grew out of an exhibition at the Institut Pédagogique National in November 1954. This was organised by the Comité d’Histoire de la Deuxième Guerre Mondiale, and Olga Wormser (with Henri Michel, the co-director of the Comité and co-organiser of the exhibition) suggested to film producer Anatole Dauman that he go to the exhibition. Michel and Dauman then agreed a new film should be made, and Dauman invited Alain Resnais to be the director. At first he refused. He felt his lack of first-hand experience of the camps would mean his film lacked the authenticity he felt essential for any effective treatment of the subject matter. However, he then relented, provided Jean Cayrol became involved to guarantee such authenticity. Cayrol’s 1946 collection Poèmes de la nuit et du brouillard had evoked his experience as a survivor of Mauthausen with great power. At first Cayrol was reluctant to become involved; the idea of revisiting these experiences was too painful for him. He offered only to take a look at the material when Resnais had his first cut, without undertaking to participate even then. However Chris Marker, a mutual friend, was able to persuade him to change his mind. Marker had collaborated with Resnais a couple of years earlier on Les Statues meurent aussi, an account of the appropriation of traditional art objects by colonial museum and ethnographic collections. This had been banned by the censors for its anti-colonialist stance, the argument that these objects, detached from their cultural contexts and meanings, had effectively been sentenced to death. The initial montage was shown to Cayrol, who was so distressed by watching it that he felt unable to work in the normal fashion, preparing his commentary shot-by-shot in the cutting-room. He did, however, write a text based on what he recalled of the screening. Chris Marker restructured this to conform to the sequence of shots in the montage. This was the basis of a final rewrite by Cayrol. Hanns Eisler was brought to Paris to compose the score, whilst actor Michel Bouquet recorded the commentary, instructed by Resnais to speak in a neutral voice, without any throbs of emotion. Bouquet felt that an actor’s credit would not be appropriate in a film of this nature. The censors requested two changes: the omission of a shot of a gendarme, apparently on duty at the transit and internment camp at Pithiviers, whose képi made him clearly recognisable as French, and of several of the shots of corpses near the end of the film, which they deemed too violent. Resnais compromised on the former, obscuring the képi by superimposing what appears to be a wooden beam. However, he refused to make the second change unless this was demanded by the censors in writing. They were not prepared to go public, and backed down. On January 31 1956, the film won the prestigious Prix Jean Vigo, obtaining an absolute majority of votes on the first ballot of jurors. In March it was chosen to represent France in competition at Cannes in the short subject category, by a unanimous vote of the 18-man selection committee. However, following a private screening for the German ambassador and numerous officials and advisers which had been arranged following what Dauman had thought was an innocent request by the son of a French minister, the Federal German government officially demanded it be withdrawn under article 5 of the Festival regulations, which provided for such action if a film was deemed offensive to the sensibilities of a participating country. The previous year, the same West German government had successfully invoked these provisions to exclude La Route sanglante (Kåre Bergstrøm & Rados Novakovic, 1955), a Yugoslav/Norwegian co-production about a group of Yugoslav partisans herded to an internment camp in the Norwegian mountains. On March 30, Le Monde reported that the British had withdrawn A Town Like Alice (Jack Lee, 1956) from competition, following a request from the Japanese. Two ministers, Maurice Lemaire, the Secretary of State for Industry and Commerce, and Foreign Secretary Christian Pineau, had, however, been lobbied by Daniel Mayer, the President of the Comité d’Action de la Résistance, and offered assurances that the film would be at Cannes in competition. On April 7, they went back on their word, though agreeing that it should be screened as part of the Festival, but out of competition. At the end of the month the prize for best short film was awarded to Le Ballon rouge (Albert Lamorisse, 1956). By this time, the German delegation had walked out of Cannes, in response to the imposed withdrawal of Helmut Käutner’s Himmel ohne Sterne (Sky Without Stars, 1955) following a protest from the Soviet Union. However, the Director of the Berlin Festival, Dr. Bauer, had told the French delegation he wanted Nuit et brouillard for his Festival. It was shown in Bonn on June 29, then at Berlin on July 1. These screenings prompted the Chair of the Bundestag (Federal German Parliament) Committee on the Press, Radio and Film to suggest that the Bonn government pay for a German-language soundtrack, so that the film could be shown throughout West Germany, which became the first country to purchase it. Commentators have generally agreed that it is precisely Resnais’ obsession with and mastery of form that gives Nuit et brouillard an emotional power unequalled by any fictional reconstruction of the Holocaust. The near-digressions of the subtly orchestrated and edited filmic narration and the ironies of the commentary capture and focus the viewer’s attention, ensuring that the most horrible images (those shots of corpses, for example, that the censors objected to) are seen with clear eyes, and that therefore their human meaning cannot be avoided. The juxtaposition of past and present ensures that the final question (“Alors, qui est responsable?”/”Well, then, who is responsible?”) is directed at the viewer, any viewer, the viewer of 1956 (when, Resnais admits, the growing war in Algeria was much on his mind) and the viewer today, living in an era of American military hegemony, ethnic cleansing (former Yugoslavia), genocide (Rwanda), state violence so extreme as to be barely distinguishable from genocide (East Timor and Iraq until recently; Myanmar, perhaps currently worst of all), and one when even democratic governments regularly label political refugees ‘economic migrants’ and return them to the grasp of their torturers. Robin Wood suggests this plea for “eternal vigilance” in Nuit et brouillard reveals an absence of “concrete material/historical analysis.” (2) However, for this writer the demand that one should examine one’s own complicity or potential complicity generates an analysis that is both concrete and personal. Just as abandoned rural paths can lead to a concentration camp, so a whole range of businesses and individuals can profit from their construction and existence. Camps have been built in the name of the radical transformation of the “fundamental premises and structures of our culture” Robin calls for. Indeed, when the film first came out, many orthodox communists feared that mention of camps might make viewers think of the camps created in the Gulag. Knowledge and memory change with time (coincidentally, this is one of Resnais’ thematic concerns, here and elsewhere). When the film was made, a decade after the end of the war and the discovery of the camps, nobody needed to be reminded who had been “the special and prime targets of the Nazis,” even if, perhaps guiltily, officialdom was reluctant to talk about all that had happened. Now, in an era of Holocaust-denial, people probably do need such reminding. Then, however, those who had been forgotten and ignored were the other victims of Nazism, and it was a shock to learn of their fate. 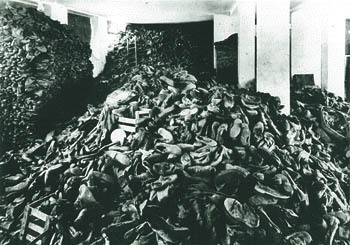 Moreover, the title of the film (and of Cayrol’s original collection of poems) indicate that the starting point of the film was not the Holocaust, but Resistance. The “Nacht und Nebel” (“Night and Fog”) decree had been directed against resisters in Western Europe, to obliterate them from human awareness. Before the genocide commenced, political prisoners were the worst treated of all in the camps. Perhaps another critic, Jonathan Rosenbaum, should be granted the last word: “this is the greatest film ever made about the concentration camps… Claude Lanzmann’s 1985 Shoah is so indebted to this film that it never could have been conceived, much less made, without Resnais’ example, and Schindler’s List is a cartoon alongside it” (4). Resnais, quoting the words of the army’s letter: “étant donné le caractère du film,” and going on to add: “sousentendu du caractère du metteur en scène, je crois” in an interview in Richard Raskin: Nuit et Brouillard: on the Making, Reception and Functions of a Major Documentary Film (Aarhus University Press, 1987). This has been an invaluable source of material for these notes. The interview was recorded in Paris on 18 February 1986. See Wood’s entry on the film in the International Dictionary of Films and Filmmakers (Michigan: St. James Press, 2000) and previous editions. Roger Michael in Cineaste 13.4 (1984), reproduced in Raskin, 1987. From a capsule review which can be found on the following websites: www.rottentomatoes.com and www.chireader.com.